Bearings for use in special environments such as clean, vacuum, high-temperature and corrosive environments, are required to have special properties, such as non-magnetic, insulating and high-speed. For this reason, regular bearings made from bearing steel and lubricant such as oil and grease cannot be used. JTEKT's special environment EXSEV (short for EXtreme Special EnVironment) series meets these requirements. 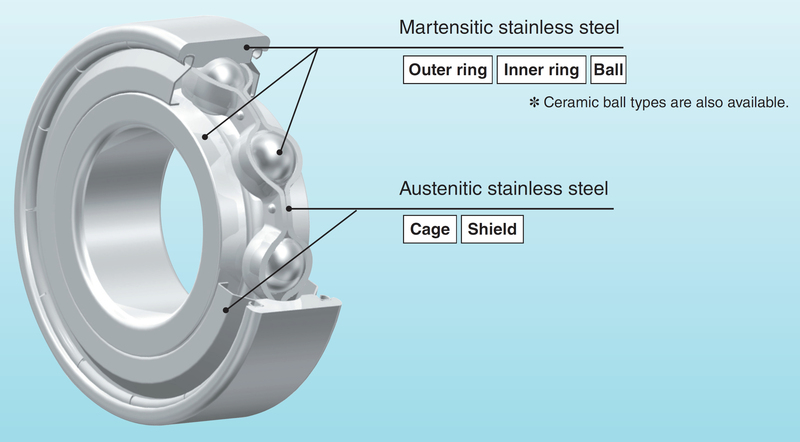 Stainless is the standard bearing material, however we offer an abundant variety of bearings to suit any given application. 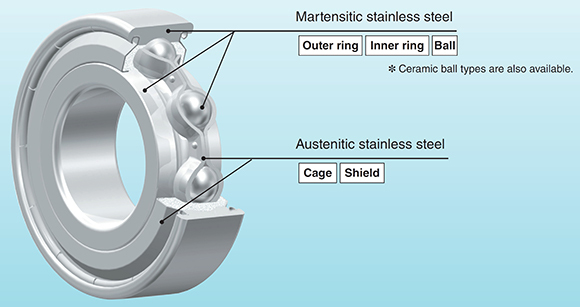 Bearing varieties include corrosion-resistant stainless steel, ceramic, high-speed tool steel, as well as bearings which use solid lubricants such as high-molecular fluorine and molybdenum disulfide coatings, resin or soft metal. 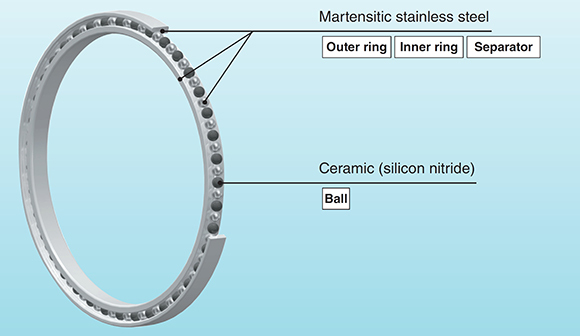 Silicon nitride is used for the bearing ring and balls in order to withstand corrosive environments. 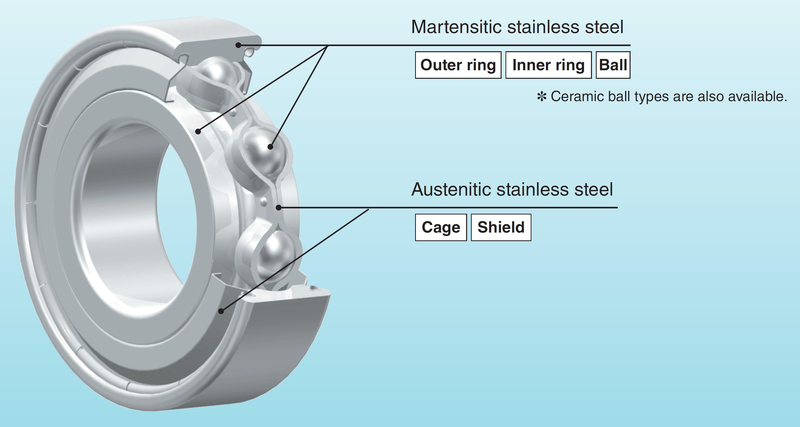 This is a solid lubricant bearing using high-molecular fluorine. 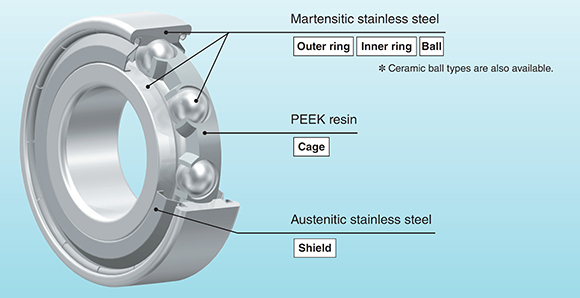 Precipitation-hardened stainless steel is used on the bearing raceway, while the balls are made from silicon nitride ceramic in order to withstand corrosive environments. 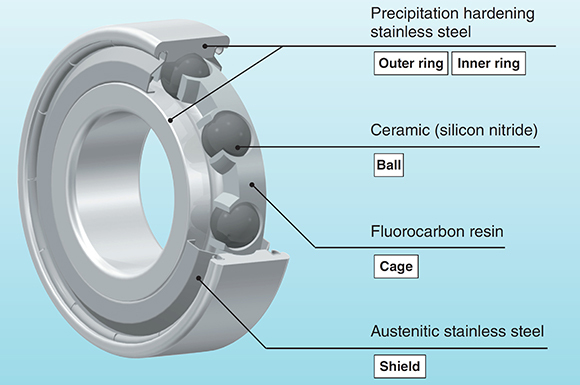 This is a solid lubricant bearing using high-molecular fluorine. 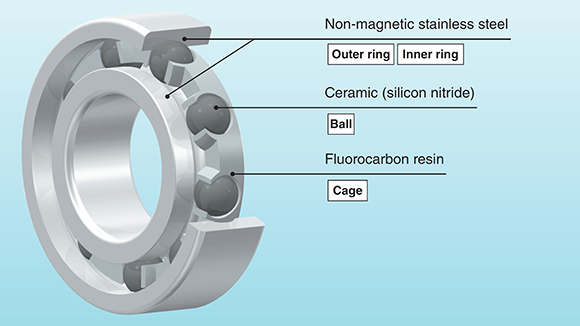 This bearing uses non-magnetic stainless steel for its ring and silicon nitride ceramic for the balls. 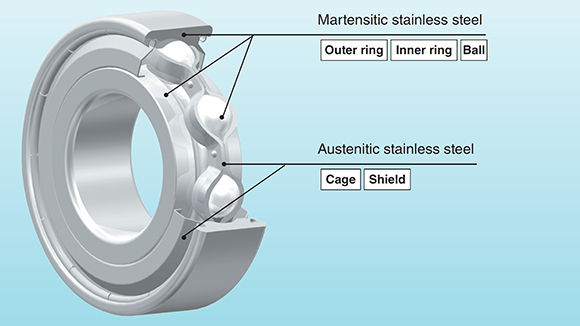 This is a solid lubricant bearing using high-molecular fluorine. This is a solid lubricant bearing with a high-molecular fluorine coating on its rolling surfaces. We have broadened the scope of highly reliable, high-molecular fluorine coating. The High-temperature Clean Pro Bearing has an excellent track record for clean-room applications and now with improved heat resistance, offers an expanded operating temperature range of up to 260 ºC. For use in clean rooms, vacuum equipment, etc. This is a solid lubricant bearing with a high-molecular fluorine coating on all of its surfaces. The high-molecular fluorine coating provides excellent lubrication and is low in particle and gas emissions, making the Clean Pro Bearing useful in clean-room applications. 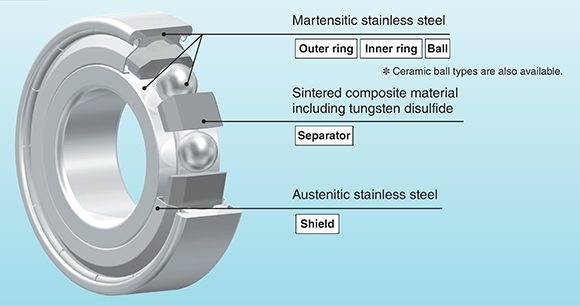 This is a solid lubricant bearing using tungsten disulfide, which boasts high heat resistance. It offers excellent load resistance compared to other types of solid lubricant bearing. 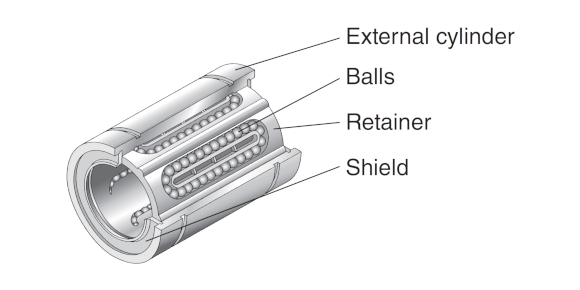 Without using a cage, the balls are retained at even intervals using a separator containing tungsten disulfide. The DL Bearing is packed with the appropriate amount of KDL grease (fluorine base) and has extremely low particle emission. 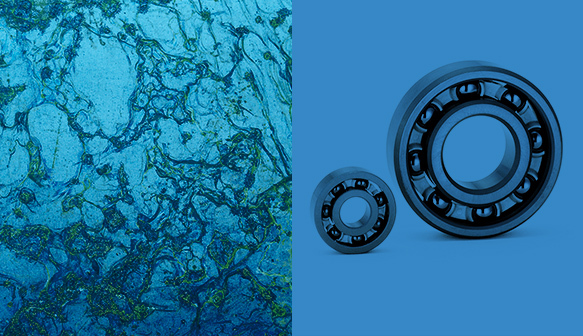 Lubricated with grease, the DL Bearings ensures superior lubrication reliability. 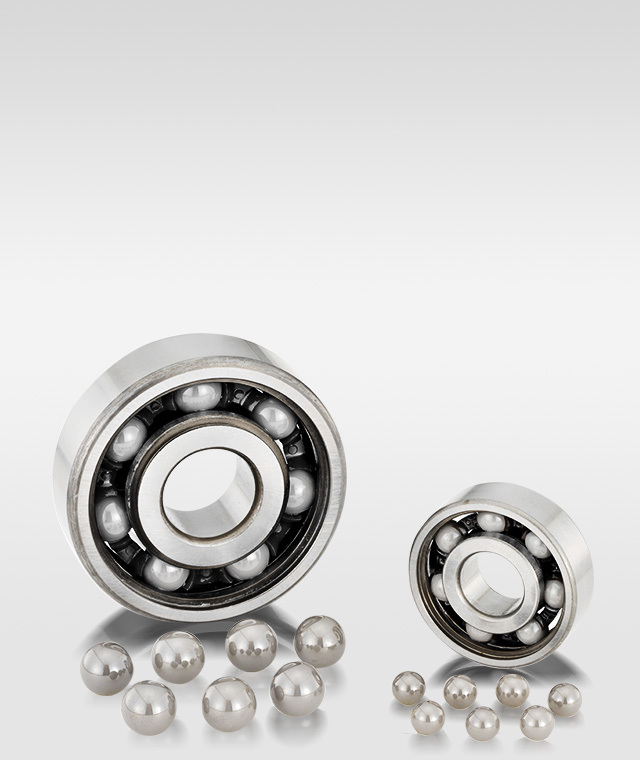 The MG Bearings are solid-lubricant bearings, lubricated with the silver-ion plating on the balls. They are suitable for ultra-high vacuum applications due to having low gas emissions. The PN Bearings are solid-lubricant bearings with cages containing molybdenum disulfide, etc. 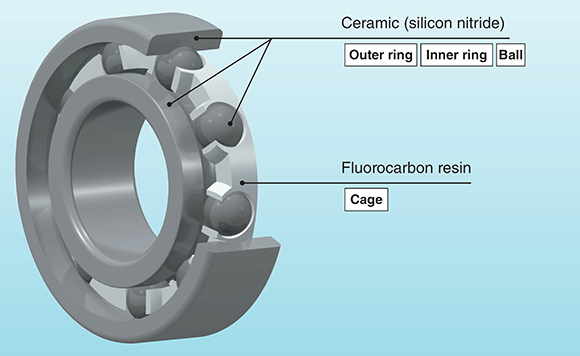 The cage is made from a highly heat-resistant PEEK (poly-ether-ether-ketone) resin, enabling the bearings to operate stably under high temperatures. Based on the K Series Ultra-Thin Ball Bearing widely used in industrial robots, this is an enhanced version suitable for clean and vacuum applications. It uses KDL grease (fluorine) as its standard lubricant. The linear ball bearing is a high accuracy bearing that makes linear motion in the axial direction while making rolling contact with the axis. This is a compact infinite linear motion bearing comprising of balls on its outer casing, a cage and a shield. A linear way is a bearing unit comprising of balls circulating inside a slide unit which performs infinite linear motion on a track rail. 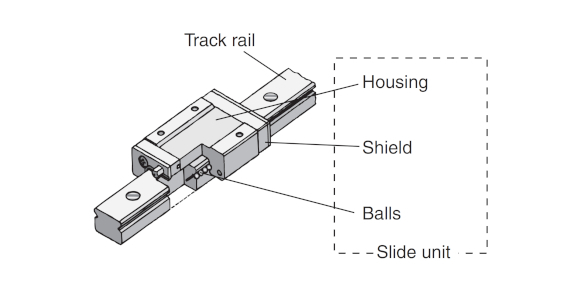 By securing the slide unit and track rail with a mounting bolt, it is possible to easily obtain high-accuracy linear motion. 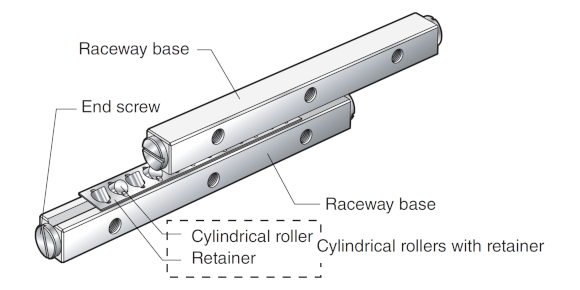 The Cross Roller Way is a linear motion bearing combining cylindrical rollers with a cage between two raceway bases with raceway surfaces made of two V-shaped planes. In this bearing the cylindrical rollers are arranged to meet at right angles alternately therefore it can withstand load in any direction and is possible of extremely high-accuracy, smooth linear motion.